GaryMoller.com - Health, Fitness - Naturally! : Is there a better alternative for weight loss than bariatric surgery? Is there a better alternative for weight loss than bariatric surgery? A morbidly obese teenager and her mother consult a weight-loss surgeon about bariatric surgery for weight loss. The surgeon advises mother and daughter that she is a good candidate for surgery; however, she needs to lose at least 10kg before they can safely do the procedure. Mother and daughter leave the consultation rooms with excitement and are straight into diet and exercise to shed those excess kilograms. Three months later, they are back at the consultation rooms where the weigh-in shows that she has lost over 15kg! "Wonderful results! ", she is told. "We can now proceed with the surgery". Now what's morally and professionally wrong about this story? Of course, the young woman and her mother should have been told to go away and lose another 10kg, and then another. Bariatric surgery, in her case, would have been unnecessary, if she had been keep on her present course of voluntary weight loss. Instead the surgery went ahead. She would have lost weight from the surgery but been shouldered with a lifetime of dependence on vitamin pills, B vitamin injections and chronic health problems over the short and longterm. My observation of bypass surgery is that there are initial and often dramatic weight losses, along with improvements in related health problems like diabetes and joint pain. However; much of these benefits are cancelled out as the years progress. Issues related to malnutrition begin to take hold, diabetes reappears, deathly fatigue sets in, as does depression, blood pressure may be sky-high and the weight may gradually begin creeping upwards. What also creeps up are the number and potency of medications - blood pressure pills, diabetes medication and antidepressants are some of the most frequently prescribed. 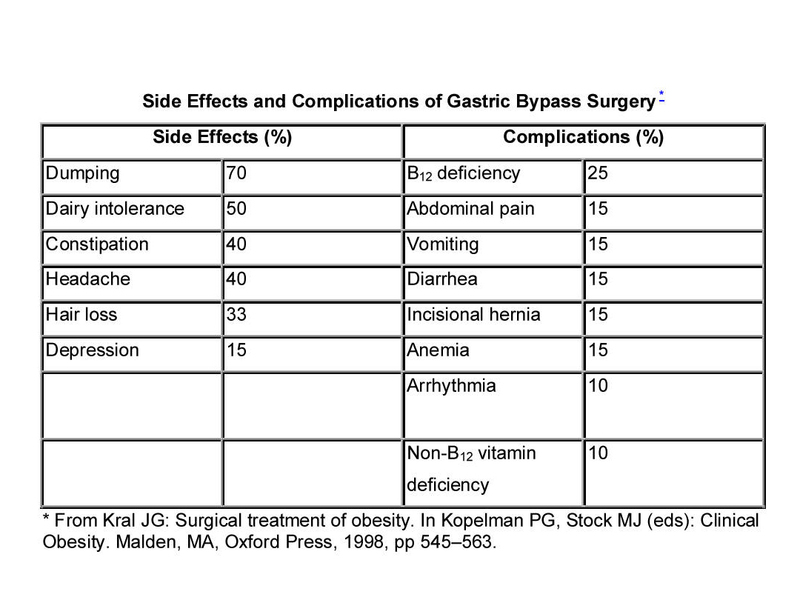 Bariatric surgery costs approximately $20,000 in New Zealand. This does not include the cost of treating the not so infrequent complications that can be many times more expensive than the initial surgery. Not measured are the social consequences that may cancel out some of the benefits of weight loss. In some societies, it is an insult not to heartily tuck into the meal prepared by your host. Dating usually involves sitting down and enjoying a meal prepared by the suitor, or relaxing in a fine-dining restaurant. Socialising with your workmates may including downing a beer or two. It is not relaxing to know you may have to leave the room, sometime through the meal to vomit. It may be easier to avoid the discomfort and embarrassment of such occasions and remain a house hermit. Obesity usually runs through a family. The father having the surgery does nothing for the rest of the family, including the children. Treat the family dynamics - not the individual! This is self-explanatory and common-sense. If family dynamics relating to eating, exercise and socialising are not taken into account, then failure is certain. Eating is central to most societies and social occasions and food choices are important. These must be taken into account when counselling on food choices and eating practices. This is done with a Hair Tissue Mineral Analysis. No need to say more about this as there is plenty to read about this on my blog. The nutritionist would visit the family to analyse their diet, organise their pantry and take them on shopping expeditions. There would be weekly home visits to ensure progress and compliance. The chef would be in the home each evening for the first week, teaching the family how to cook healthy meals. This would reduce to once or twice a week thereafter. Every morning at 6am their personal trainer will be knocking on the door to take the family through their paces. This may be a brisk walk in the morning sun or a strenuous cross-fit class. We would go pretty hard-out for three months. It takes at least eight weeks for old habits to be replaced by new, healthy ones, so 12 weeks is sensible. After three months there will be a gradual withdrawal of the service gradually cutting the family loose to be fully independent of outside help. Can I do this all for $20,000? I could do it for half that - But I'll take the 20k, thanks. "Sounds like a good plan, Gary, so what's stopping you?" It will never happen. It is pure fantasy. People have been brain-washed into expecting the easy quick-fix. They have been soothed into a sense of false security about the safety and the wonders of high-technology medical solutions. I don't wear a white coat. In addition, all the funding has been corralled by a small group of elite professionals and there is no way hopeful interlopers, like Gary Moller, are ever going to get their dirty little hands on THEIR money!